Prairie Woods Environmental Learning Center is a 501c3 nonprofit organization committed to providing outstanding environmental education and outdoor experiences to people of all ages.Deeply rooted in our Kandiyohi County community, we reach out to provide services for communities across Minnesota and the upper Midwest. Prairie Woods provides customized programs for organized groups on a reservation basis. Walk-in visitors are welcome to use hiking and ski trails during daylight hours throughout the year. Families and small groups please call ahead to make reservations for program activities and facility use. An education building with 5 classrooms, a trailhead and a 30-foot indoor climbing wall. A pavilion which is a 45x80 3 season-enclosable space. The Gary Westby Observatory building sits atop Prairie Wood's highest hill. Several beautiful spaces are available for meetings, family reunions, holiday gatherings, and weddings. Also onsite is the Gary Westby Educational Shooting Sports Range. We will promote an individual and shared commitment to the responsible use, management, and preservation of our natural resources. In short: Learning to Live Well with Self, Others, and the Environment. More than 12,000 years ago, the most recent glacier receded to reveal dramatic ridges and wetland-rich lowlands on this land. For thousands of years, Native American people found their livelihood among the shifting forests, prairies, and wetlands here. Anders Danielson and his family settled this land when they arrived from Sweden in 1871. 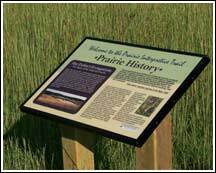 Until the late 1980s, most of the land belonging to Prairie Woods was farmed by the Danielson family. The land was sold to Kandiyohi County by the Danielson family. Prairie Woods Environmental Learning Center was founded in 1992. The farmsite is still present, with a barn, granary, and farm house. Many bur oak trees on the property are more than 100 years old. A renovated log cabin also sits near the farmsite in the exact location where the Danielson family built their first log home, prior to building the frame house.